My ten-year-old granddaughter, Collette, and I co-wrote this children's book, which was published in 2015. 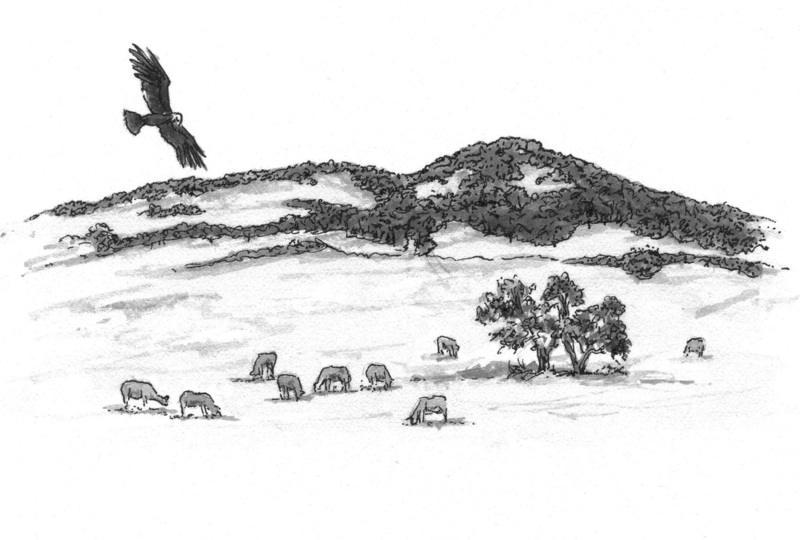 The plot: One hot August morning, Vanessa, a young turkey vulture, is hunting for food when she spots a half-buried dog in a field. She swoops down and enjoys a savory meal. As she flies home, she begins to feel sick. Before long, she falls from the sky and crashes into a stranger's backyard. She's scared, unable to move, and desperately wants her mother. She trembles with fear as a human shadow closes in on her. What made her sick? Will the human harm her? Will she ever see her family again? Vanessa’s Rotten Day is a whimsical tale based on a true animal rescue story. After reading it, you’ll never look at vultures in the same way. To order a book, click here. Facts: The image on the left is a random vulture my husband photographed in the wild. The image on the right is the vulture who crash-landed in my backyard. The Humane Society rescue worker took the nearly dead bird to WildCare in San Rafael. Collette named the vulture Vanessa after her 'little sister' at school. Turkey vultures are important to the ecosystem, essentially serving as nature's trash collectors for animals that die in the wild. Some people may find that distasteful, but just imagine what would happen if we didn't have Vanessa and her friends cleaning up the road kill all around us. Turkey vultures have a highly developed sense of smell, and their digestive system is capable of killing any viruses or bacteria they eat. They are protected by the federal Migratory Bird Treaty Act of 1918 and California Fish and Game Code. 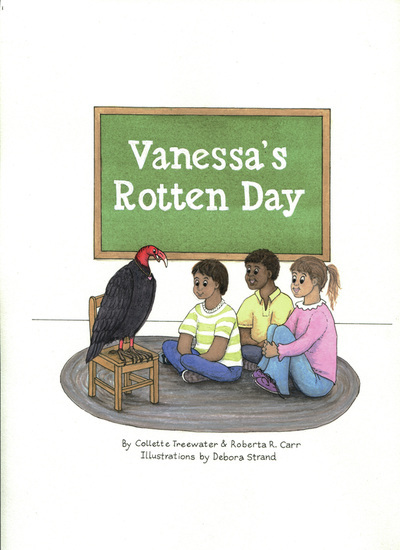 November 11, 2015 - While writing Vanessa's Rotten Day, Collette and I worked to find a balance between creating an entertaining tale, and educating readers about turkey vultures. For me, the fun part of writing a story is the research. Yesterday we met with Melanie Piazza, Director of Animal Care at WildCare. 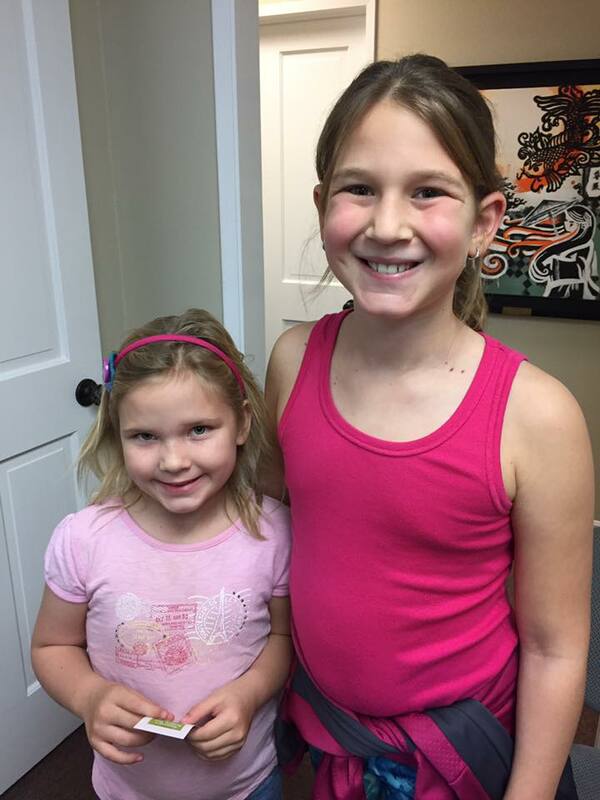 Melanie oversaw the treatment and release of Vanessa back in August, 2014. What a treat it was to receive a behind-the-scenes tour of the hospital. Melanie described what happened to our vulture while she was a patient, and explained animal rehabilitation goals. This picture of the three of us was taken in the large aviary where Vanessa convalesced before her release back into the wild. ​The illustrator finished the cover illustration, and forty-three black and white images for the interior. Didn't she do a wonderful job at creating a whimsical, yet authentic character? I mean, who wouldn't love this turkey vulture! Can you see Vanessa's heart pendent? My friend, Cheryl Tsieprati, lives in Simi Valley, California. She had recently purchased our book, Vanessa's Rotten Day. Today, she glanced in her backyard, and guess who came to visit? Thanks to Cheryl for sending this fun picture to us. Has Vanessa visited anyone else? Six-hundred and twenty-three people entered a Goodreads contest, hoping to receive a signed copy of Vanessa's Rotten Day. Congratulations to the following winners! We hope you enjoy reading about Vanessa's adventures. Collette popped into Copperfield's Books to check on sales. Guess where she found the Vanessa's Rotten Day? Up front on the 'Staff Recommends' shelf. An employee told her, "The books are flying off the shelf!" 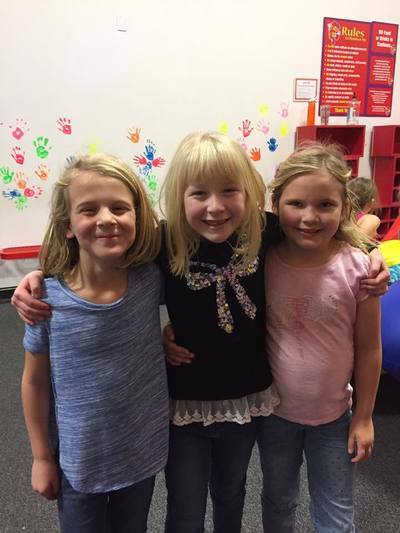 What a fun experience for a ten-year-old. 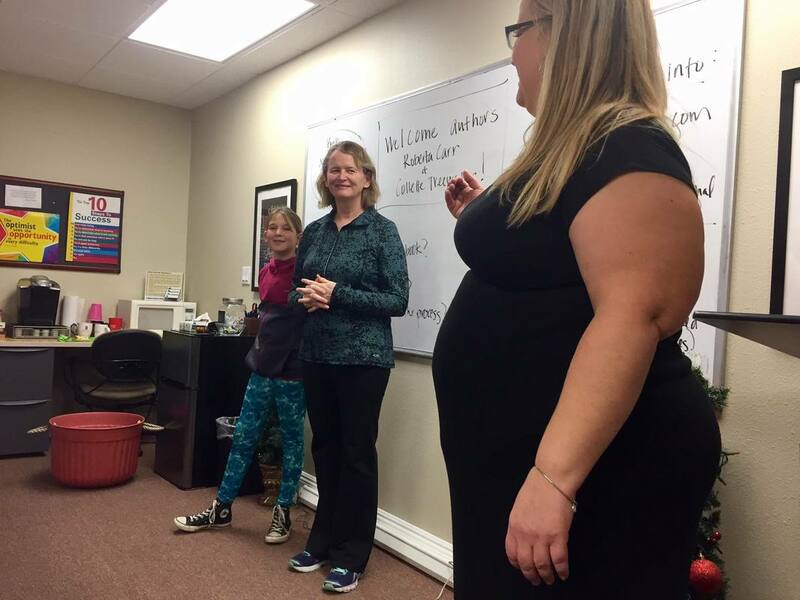 My daughter, Kim, hosted a book signing at her office in southern California. Coco and I enjoyed meeting some terrific people and sharing our writing journey. After enjoying Vanessa cookies (thank you, Aunt Kimmy), the kids visited BounceU for two hours. A wonderful day! 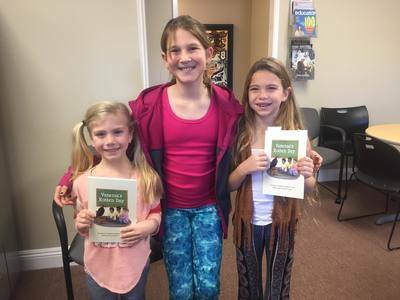 ​On February 22, 2017 Collette and I traveled to southern California to discuss our writing journey with Girl Scout Troop 3351 and Cub Scout Pack 529. The kids asked such great questions! Having a young author share her experience motivated other budding writers to keep following their dreams. "Don't give up," Collette told the audience. 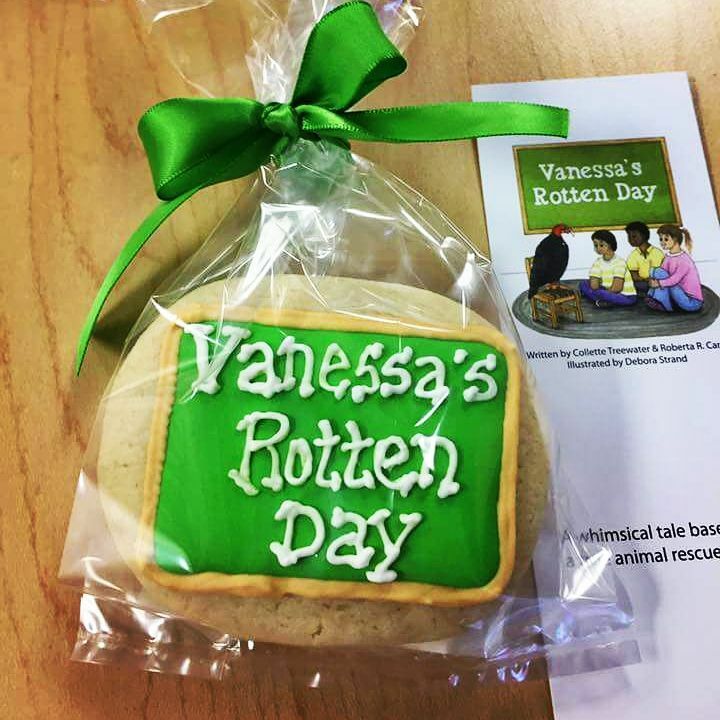 "It took me two years to write Vanessa's Rotten Day." Public speaking is frightening for adults. Can you imagine being ten-years-old standing on a stage looking into the eyes of at least sixty people? Collette was nervous, but she overcame her fear. She thanked her mom and dad, her aunts, Kimmy, Gaye, and Camille, her sister, Sierra, and her cousin, Camden, for their unwavering support. "It takes a lot of people to make a project like this happen," Collette told the audience. "I wouldn't be up here without my family." Thank you, Sadie Melgoza for making it all happen! Collette had an opportunity to read Vanessa's Rotten Day to Mrs. Bordley's 4th grade class at Glenwood Elementary School in San Rafael. The kids asked some great questions about the story and the publishing process. Every year the Mary Silveira Elementary School hosts a Young Authors Day. 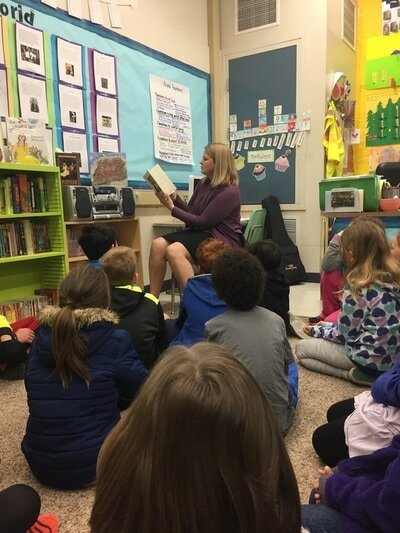 Volunteers--mayor, councilman, superintendent, opera singer, educators, and minor league ball player--visit classrooms and read a favorite book to children. Collette and I had the privilege to participate this year. We met Mrs. Nichols' 5th graders and Mrs. Hu's 3rd graders. 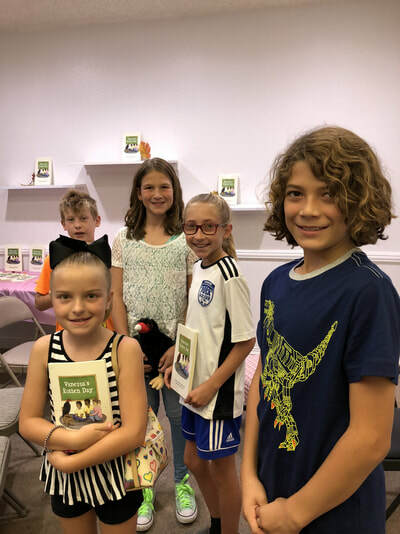 The kids were excited to meet a child author, and they asked Collette many questions (and asked for her autograph). Mrs. Hu's students were in the middle of writing a book, and they shared their work with us. CoCo and I detected some talented writers and artists. The breakfast buffet, gift bag, and ID badge impressed CoCo. She felt like a celebrity! Thank you Mary Silver team for making us feel so welcome. CoCo and I love doing these events, so if you want a young person to inspire other young people, let us know. 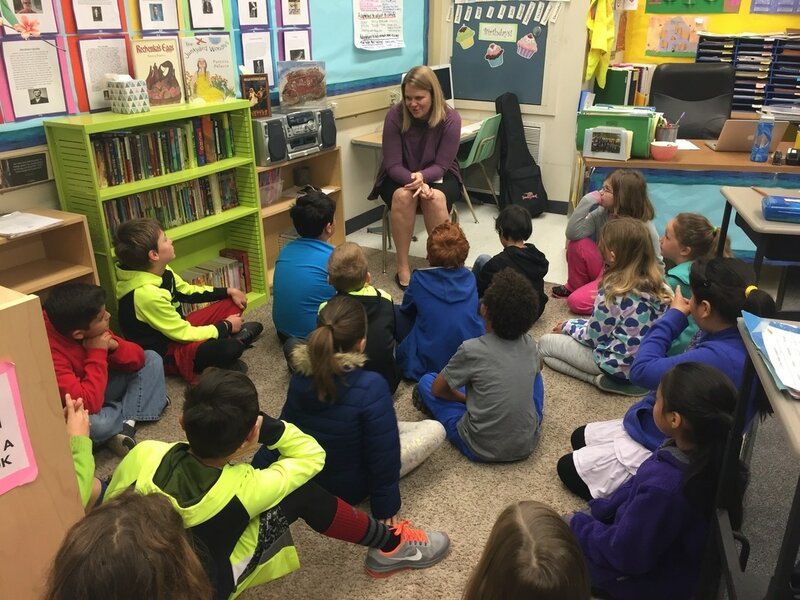 Principal Kristy Treewater read Vanessa's Rotten Day to students at the Vallecito Elementary School in San Rafael. 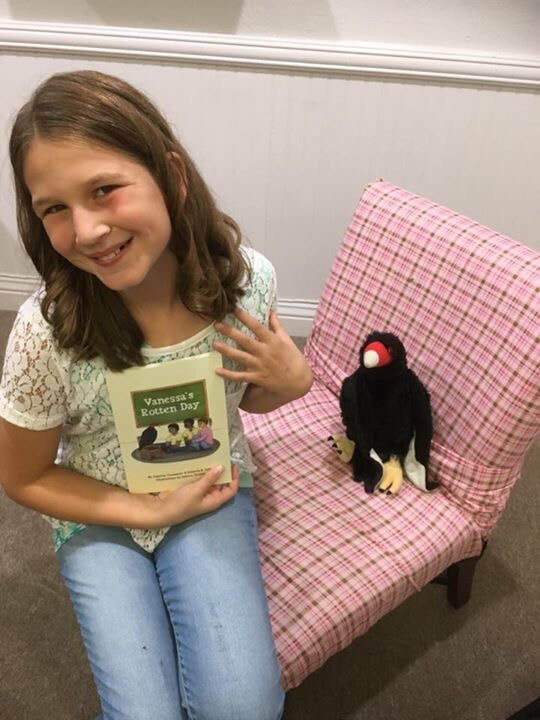 We're educating kids about vultures one group at a time! My friend, Cheryl McCaughan and her nephew, Troy Gough, met one of Vanessa's cousins, Lewis, during a recent vacation. When Lewis was a nestling, he was brought to a rehabilitation center in Utah with fractures to some of his left wing bones. These bones had begun to heal out of place. As a result, Lewis's wing does not work correctly and he cannot fly. Vanessa visits him from time to time and wants you to know her cousin is doing just fine. Just like Freddie, he'll never leave captivity, but he's glad to have wonderful human friends who care for him. 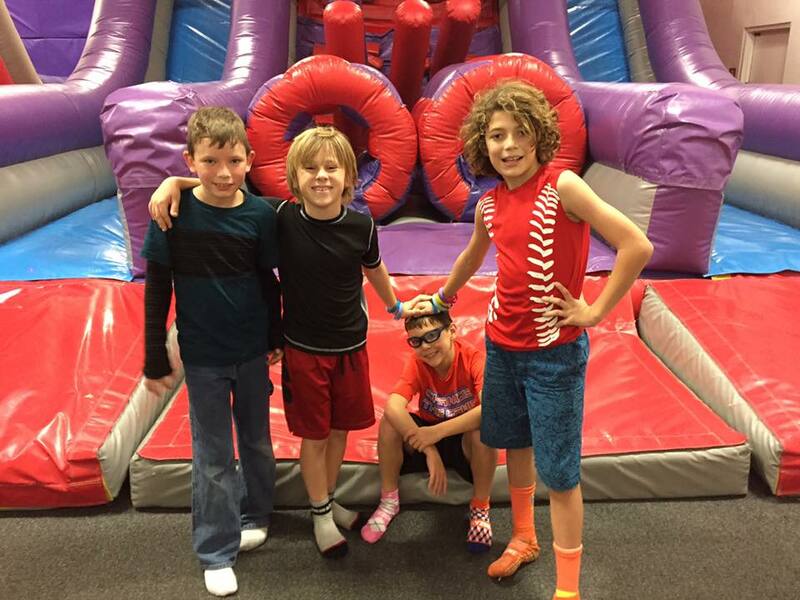 Thanks for sharing Lewis's story! 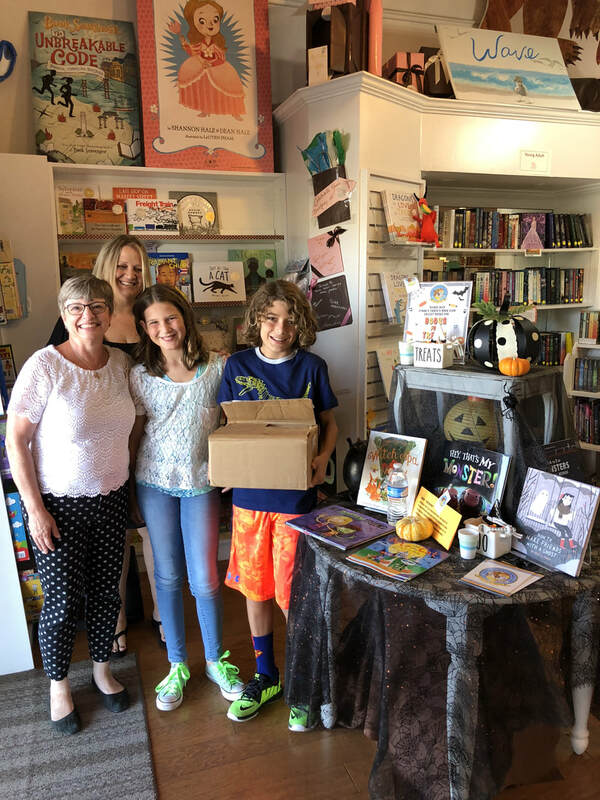 Collette and I flew to southern California for a book signing of Vanessa's Rotten Day at the children's bookstore, Once Upon a Storybook. We appreciate Susie Alexander for hosting the event. A special shout out to Aunt Kimmy for coordinating everything. We love you! Collette savored signing the 'authors' wall' in the store (thank you Aunt Gaye for the photos). If you live near Tustin, I encourage you to take your children or grandchildren to this captivating bookstore. You won't be disappointed. *** Collette is an engaging speaker. She loves sharing her writing experience. If you want to host a special event that encourages young people to pursue their dreams, Collette can help. Please contact Roberta to make it happen. Collette and I were thrilled to join several other authors to speak at a fundraiser in Campbell, California on April 17, 2019. This was the 29th annual event, which is hosted by the Santa Clara Valley chapter of the Brandeis National Committee with support from the Assistance League of San Jose. We both were excited to meet Bruce Cameron who wrote A Dog's Purpose (he was also the screenwriter on the movie). I spoke for fifteen minutes about my writing experience. Collette followed, standing in front of more than two hundred people, her voice strong, her story compelling. I was a proud Mimi, watching her speak from her heart. I think we inspired some grandparents to support their budding-writer grandchildren. ​Jean Downey has my deepest thanks for making this opportunity available to us. I also thank Dorothy Strang and her daughter, Christy, for coming out to support us. What a day!